This five-storey brick building on Pioneer Avenue in Winnipeg was constructed in 1906 for the Scott-Bathgate Company, a candy and nut wholesaler operated by A. E. Scott and James L. Bathgate. Initially, the firm occupied only a portion of the space, with such firms as Strong Scott, Moirs, McLeods, and Western Vinegar occupying the remainder. Four years later, the building was expanded by a five-storey addition to its west side. 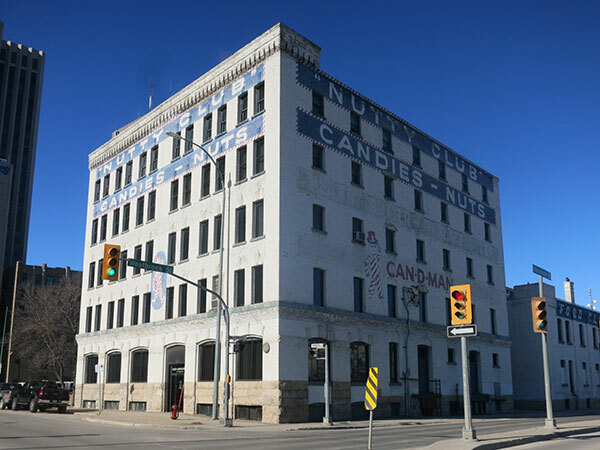 Known for its “Nutty Club” character painted on the outside, it is sometimes referred to as the “Nutty Club Building.” The company also owns an adjacent annex facing onto Portage Avenue East that is connected to the building by an overhead causeway. In June 2017, it became a municipally-designated heritage building.